Bohemian Rhapsody is a half musical half biographical film about the rock band Queen and its rise to fame in the 1970s and 80s with particular attention on the life of the band’s lead singer Freddy Mercury. Born as Farrokh Bulsara to traditional parents from India who immigrated to London, Freddie Mercury’s story as a bold, risk-taking visionary is one that will inspire and fascinate audiences, despite this film smoothing over many rough edges of the band’s life. 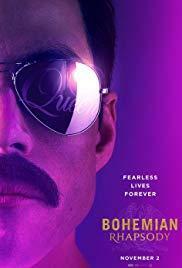 This film is a fun ride because it’s well balanced, showing frenetic energized scenes of Queen creating their distinct rock-n-roll voice but also showing quiet lamenting scenes about Freddy Mercury’s personal life (divorcing his wife, reconciling his homosexuality, and learning he is HIV positive.) Director Bryan Singer (X-Men Apocalypse, 2016) shows surprising patience with this film because it has a number of scenes simply showing the band performing great music with a magnetic authenticity from the 4 actors. This film's focus on Queen’s iconic songs reminds older audiences, and educates younger ones, of the band’s brave creativity with new instrumental innovations, blending of musical genres, and interacting with audiences in ways not done before. Does Bohemian Rhapsody skip over lots of history and slap a heartwarming polish on the unsavory or difficult parts of this band’s life? Yes. Does the film show Freddie Mercury’s personal life through a sexually tame lens? Yes. But the film still delivers an entertaining story of a band, and its flamboyant leader, whose style defined a generation and gave a voice to disenfranchised listeners everywhere.